Summer is almost here! This is my kids' last week of school, and starting next week they'll be off on their summer adventures. We have a few trips planned, as well as soccer, cooking, and dance camps. They'll be putting away their school backpacks, and taking out their suitcases, sleeping bags. Of course, they'll be keeping their lunch boxes and water bottles! That's a lot of equipment! If your kids are anything like mine, they tend to lose a lot of stuff. They drop jackets, caps, water bottles and other things by the wayside, and once they're out of sight, they're out of mind. My kids move on to the next thing, and their stuff is forgotten. And if you're anything like I am, it drives you mad!! I'm constantly reminding my kids that I paid tons of money for their gear and threatening to make them pay for it out of their allowance. Of course, they couldn't afford it, so the next best thing for my sanity is to label everything to lessen the chance that my kids' stuff stays lost forever. I label everything -- not just clothing, but also pencils, scissors, reusable containers (and their lids! ), etc.. Contains 16 Mini Custom Name Stickers, 21 Tag Mates Stick On Clothing Labels, 2 Custom Shoe Stickers, and 2 Personalized Bag Tags (41 labels for $19.99). Perfect for kids heading to day camp! The labels are UV resistant and waterproof. Sleepaway camp requires a lot more stuff, so this pack has larger quantities of the labels you will need to make sure you kids' stuff comes back home. 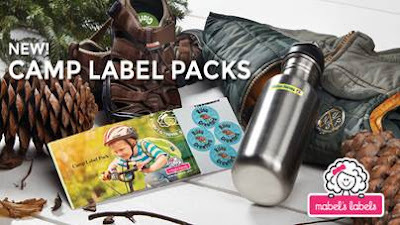 Contains 10 Personalized Name Stickers, 24 Mini Custom Name Stickers, 50 Tag Mates Stick On Clothing Labels, 8 Custom Shoe Stickers, and 2 Personalized Bag Tags (102 labels for $39.99). Mabels Labels also makes customized disposable emergency bracelets (pack of 30 for $21) so that kids with allergies or other conditions will always have contact information and medical information on hand. These are also great for days out at theme parks or the beach (whether they are with a camp group or with the family!). Mabels Labels let me pick out and personalize a Day Camp Label Pack and a Sleepaway Camp Label Pack, and I can't wait for them to arrive! It takes less than a minute to order and personalize labels -- just type in your name (you can personalize a second line on your labels with a phone number, camp cabin number, etc...), choose your label colors and designs, and choose your font. There are a ton of designs (make sure you check out their limited-time summer camp themed designs!) and colors, so your child gets a label that matches their interests and personality. Stay tuned, I'll post photos of our new labels when they arrive! Order your Mabels Labels Summer Camp Label packs ASAP, because they're only here for a limited time! Disclosure:I received complimentary camp label packs to facilitate my review. The views and opinions expressed here are my own. Have you ever been to Australia? 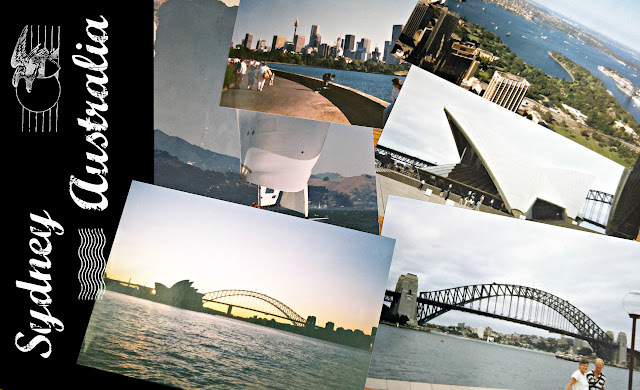 My husband Alfie lived in Australia for five years, and he loved every minute of his time there. He says the weather is great and the people are so nice. I know he misses sailing around Sydney Harbour, eating lunch near the Opera House, relaxing by Bondi Beach. He keeps telling me that we need to visit! I'm a total travel hound, so I couldn't agree more, but the reality is that tickets to Australia are expensive, and with five of us in the family, we're going to have to move Sydney back a couple of places on our bucket list until the kids are in college and we can go off on our own. But a girl can dream, can't she? Speaking of Australia, I'm excited to share with you an exciting sweepstakes from the folks at the a2 Milk Company™! 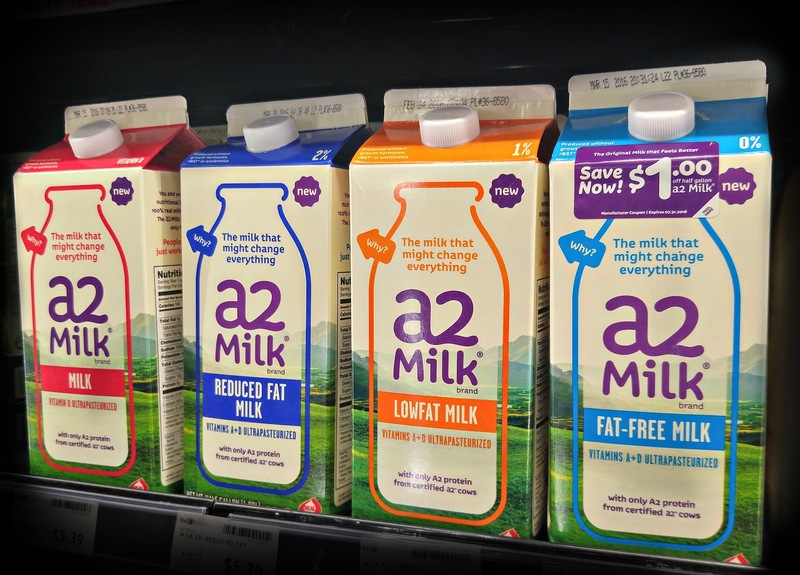 I was named an a2 Milk® Ambassador a couple of months ago, and it has been great because not only did we get to try their milk (which tastes great and is great for sensitive tummies), I got the scoop on the prize: they are giving away a vacation for 2 to Australia! The winner will receive a five (5) night trip for two (2) with round-trip airfare, hotel accommodations, and $750 towards food and other expenses. The grand prize winner will be selected on or about Thursday, August 11, 2016. So why Australia? a2 Milk® uses cows based in the USA, but originated in Australia. I guess the destination is kind of a nod to the original herd! And why are these cows so special? Because unlike most other herds of cows, they produce milk that is naturally free from the A1 protein, which is the culprit behind "Post-Dairy Digestive Discomfort". What this all means is that a2 Milk® is perfect for people who experience tummy troubles or Post-Dairy Digestive Discomfort, but still want to enjoy real cows' milk, not some milk substitute! You can read more about it in my original a2 Milk® post or on the a2 Milk® Microsite at http://trya2milk.com/. Obviously only one very lucky person is going to win that trip to Down Under, but you're still in luck, because the a2 Milk Company™ is giving you the chance to try a2 Milk® for free! They're offering the first 1000 respondents to redeem their receipts for the full purchase price of a2 Milk®. To find out how, go to the a2 Milk® Microsite at http://trya2milk.com/. Don't worry, dear reader; that's sparkling apple juice in the kids' champagne flutes! One of the most wonderful things about seeing kids grow is seeing how they change their minds. That ability to adapt is how they end up discovering favorite new foods, taking up new hobbies, and making new friends. Of course, that ability to adapt can also be challenging for parents as they are exposed to ideas and habits that clash with the values that we as parents are trying to instill in our kids. Two years ago: I hate jeans. I can't move in them and I can't breathe in them. Two days ago: I need more jeans. They're all I wear! Two years ago: I can't drive an Autopia car without crashing into the rails! I'm a terrible driver and I'm never driving, ever. Two weeks ago: I'll be old enough to get my driver's permit in 6 months! I can't wait! Two weeks ago: Mom, I hate the taste of alcohol! You don't ever have to worry about me drinking! Two years from now: ???? She's a freshman, and already some of the parties that her friends have been invited to have featured alcohol. What's it going to be like when she goes to prom in just a few years? I think it's never too early to start talking to your kids about topics like alcohol, underage drinking, or drinking and driving. Want some tips to get your conversation started? Check out the Prom Drinking Guide that I wrote in partnership with SheKnows and Anheuser-Busch, and check out Anheuser-Busch's Family Talk About Drinking initiative on Facebook, Twitter, and Pinterest.